Merry Christmas from Four Seasons Shopping Centre! To help make your Christmas shopping easier (and that bit more enjoyable), Four Seasons will be hosting lots of free family activities over the festive period, as well as opening late on selected Thursdays. The Ping Pong Parlour will be open 5pm - 8pm from the 22nd November to 20th December, where you can play for FREE. 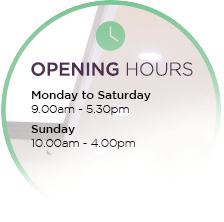 *Individual opening hours may vary. Free parking only available on late night Thursdays.